Hi Friends, I’m just back from a hurricane weekend! The Idyllwild concert was a true highlight. The day couldn’t have been better with perfecto temperature flowing and the tall green pines framing the parachuted amphitheatre, music filling the air and the fine folks of Idyllwild making sure it was all just right. Bravissimo! In last week’s gig email I included a photo of me playing the guitar with a women in the background, possibly questioning what I was up to. My friend Garry wrote back with some alternate things that she might have been thinking as I was playing. "He needs a haircut. Doesn't he know it's 2010?" 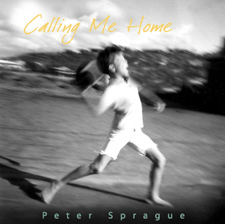 "He calls that music? Where is the melody?" "I can't imagine what my boss sees in this music, but, hey, he wanted me to hire this band." "He makes a living doing this?" This is the flyer for the Dizzy's gig on Wednesday. 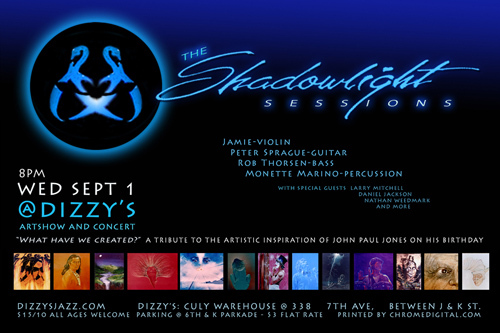 For this week I’m playing a show at Dizzy’s with violinist Jamie called the Shadowlight Sessions. It’s a tribute concert to the artistic contributions of John Paul Jones. Both Jamie and John Paul designed my website years ago and their way with color is amazing. It’ll be a cool evening of music and John Paul’s art. Look below for the deets. On Thursday night I’ll be returning to the Roxy in Encinitas for an evening of solo guitar. I’ve been gone for a couple of weeks and I can’t wait to order up the Sunrise smoothie and get down to business. Hope to see you there! And rounding out the week is a Sunday evening house concert in Del Mar with vocalist Leonard Patton and myself. It’s open to anyone and look below for the way to get tickets and the start time. It’s for a good cause too. That’s it folks. I just took my daughter to the first day of 11th grade in high school and it’s incredible how this life just pushes it to the floorboard, speeding like a wild man and never looking back. I wouldn't trade it for anything! Leonard Patton  vocals 6:30 PM We're playing this house concert and it's called the Joy of Life, honoring the memory of Glenda Joy Herczeg and all those who battle lung cancer, with the hopes that the disease will become better understood, and more people will experience the joy of life in good health.